Set five years prior to the events of A New Hope, Star Wars: Rebels follows the exploits of a motley crew of… well… rebels… as they try their hardest to destabilise the empire, one small bit at a time. 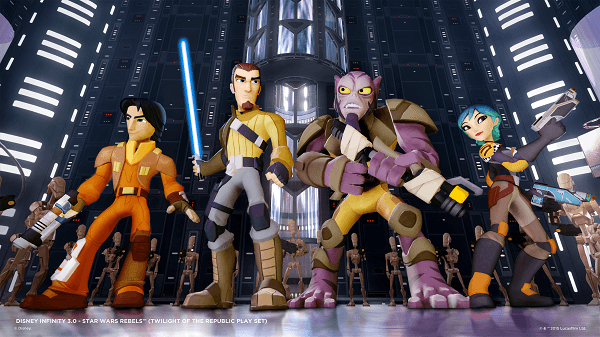 Well, instead of just following along their adventures on television, now you can create your own with the range of Star Wars Rebels characters for Disney Infinity 3.0. 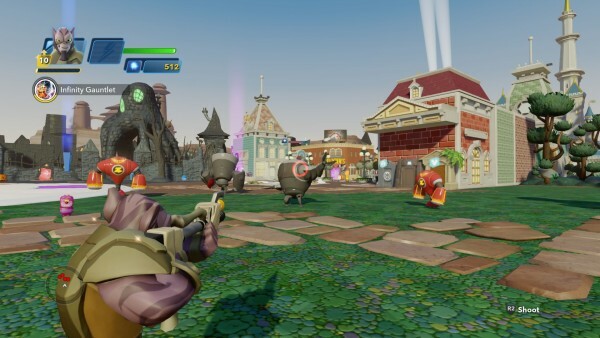 While they don’t have a Play Set of their own, the crew of the Ghost can be used in the Toy Box (as well as the Takeover and Speedway Expansion games), and can even cross over into the Star Wars Play Sets once their crossover token has been found. Each member of the Rebels set is a mixed melee/ranged fighter which gives them excellent versatility. 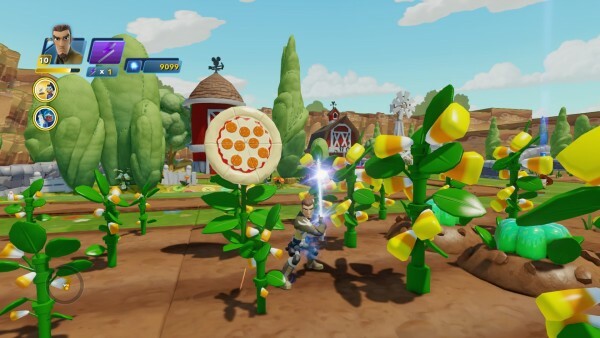 Due to this, they are some of the more well rounded and fun characters in the game. A Mandalorian explosives expert with a hatered for the empire and a love of bright colours, the quick-witted Sabine is the artist of the Ghost crew. While she is no slouch when it comes to hand-to-hand combat, Sabine excels as a ranged fighter. Armed with dual blaster pistols, and with a pocket full of grenades, Sabine can be used to create all kinds of havoc in the Toy Box. What is easily Sabine’s coolest trait is the fact that her aerial combo almost mirrors those that Dante of Devil May Cry fame would do. Visually, Sabine has some really cool stuff going on. Her paint grenades are filled with all of the colours of the rainbow, and look really awesome as she hurtles them at her foes. The Ghost’s muscle, Zeb has a tough exterior but a heart of gold Zeb is the last surviving member of his people, the rest of which were brutally slaughtered at the hands of the empire. As such, Zeb harbours no find feelings for the emperor or his regime. Zeb is easily one of the most versatile characters in the entire Disney Infinity franchise. He has super strength, super jump, wall crawling, brutally strong combo attacks, a blast rifle and is also a tech wiz, allowing him to access control panels and other tech goodies in the Play Sets. Kanan and his apprentice Ezra are unique among the force-using characters in the game in that they have access to a blaster. 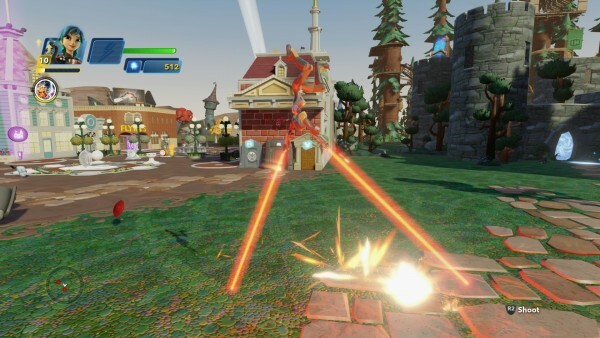 This gives them a long range attack, but sacrifices the force dash that the others posess. 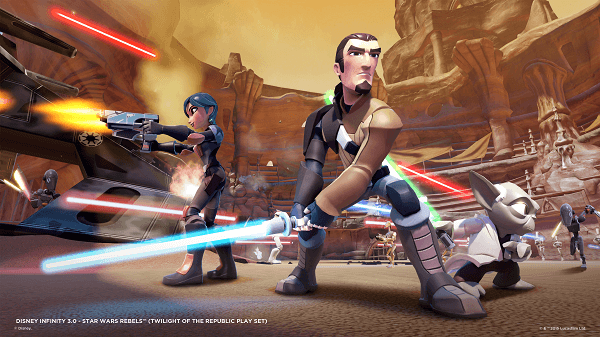 even without his force dash, Kanan is fast on his feet, able to charge into battle at a moments notice. His swings are precise and quick, and the fact that his combo string ends with him shooting people might be the coolest thing ever. Ezra is a young, reckless street kid who has only recently learned of his status as a force-sensitive. As a member of the Ghost crew, and under the tutelage of Kanan, Ezra is learning what it is like to be a part of a family as well as a Jedi. Ezra is perhaps my favourite character to play as in DI3.0, and it is because of the story that the character tells. 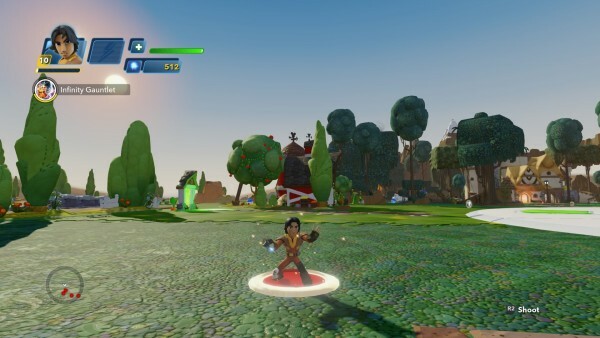 When you first place Ezra on the Infinity Base, he has no force abilities as these have to be unlocked as he levels up. This perfectly reflects his growth in the actual tv series, from someone who is unaware of their connection to the force, through to a full-fledged apprentice. Not only that, but Ezra’s move set is similar to Kanan’s which emphasises the bond between student and master. If you’re a big Star Wars: Rebels fan like myself and are wondering where Hera is, she is available as an in-game townsperson once you link your game with your Disney account. Doing also will also grant you access to the rebel’s ship; The Ghost as a playable vehicle (and let me tell you, that bad boy is FAST). The Star Wars: Rebels line of figures are an excellent addition to the Disney Infinity lineup. They both feel like a cohesive unit and a series of individuals, which is incredibly hard to pull off. Whilst each of these characters are playable in the Star Wars Play Sets, the fact that they don’t have a story of their own to tell in the game holds them back from being really great.